I’m a big fan of Asian flavors. As a kid I practically lived on rice with soy sauce on it. One of my all-time favorite meals is cashew chicken. When I crave this favorite, this is the recipe that I go to. You will not believe how tender the chicken is. I found Rasa Malaysia’s cashew chicken recipe about 2 years ago and instantly fell in love. All of Bee Yinn Low’s recipes are amazing but this one, specifically the method for preparing the chicken, is no-fail. I now use this method in many of our favorite chicken dishes, and I promise you, you will fall in love with the texture. The secret? Baking soda. I know. Just do it and you’ll see. It can’t be beat. Tender chicken and stir fry veggies in a classic sweet and salty sauce. Marinate the chicken with the baking soda for 15 minutes. Rinse the chicken thoroughly with water and then dry the pieces. Ensure that the baking soda is completely rinsed off and that the chicken is dried well. Stir the cornstarch and rice vinegar and toss with the chicken and let marinate for another 15 minutes. Heat a large skillet or wok with 1 Tb. canola oil and stir fry the chicken meat until it’s white and just underdone, about 3 minutes. Dish out and set aside. Add another tablespoon of cooking oil to the pan and add the ginger, mushrooms, peppers and yellow onion. Stir fry until the peppers are aromatic and add the chicken back in along with the green onions, garlic and cashews. Stir and let cook for 2-3 minutes more. Substitute any vegetables that you have on hand for the stir-fry. I like to add fresh green beans, broccoli, red peppers and water chestnuts to this dish. I serve brown rice along side the cashew chicken. This dish is a favorite of mine! Gorgeous pics! I think you know how I feel about this… I NEED THIS IN MY LIFE!! Now, I want this for dinner asap! Looks terrific! Great dish Cassie & fantastic pics! I will be making this very soon! So interesting, adding baking soda to the chicken. The sauce sounds delicious! 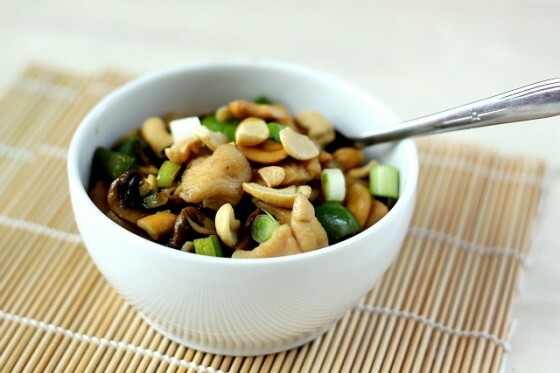 too funny — jason’s favorite nut is cashew and he loves cashew chicken & white rice w/soy sauce. clearly when we have a double date, you two will get along just fine! lookin’ good, cassie! That’s one of my favorite asian dishes to order out so I will totally be trying your recipe to have it at home. I love cashews and chicken together. And we must have known each other as kids because I also went through a serious period where all I ate was rice and soy sauce! My mouth began watering as I read this post this morning. 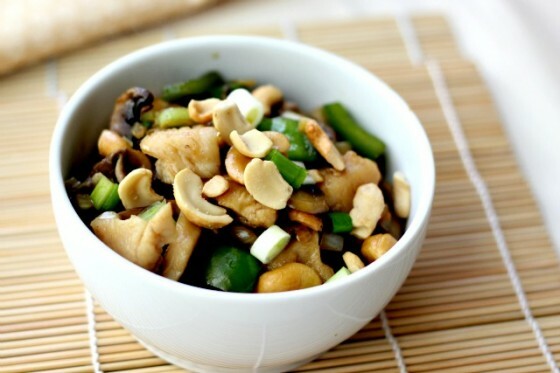 This cashew chicken might hold LuLu to a fun, swashbuckling taste test! Your photos are lovely, bright and speak/smell volumes about your blog posts. I admire your talent and love you much! I know what is going on the dinner menu for next wee! This looks delicious. Beautiful pictures! The Asian cooking in my kitchen is definitely lacking, but this would be a wonderful first step. This looks so delicious Cassie, and super simple! Thanks for sharing! Have a great weekend. 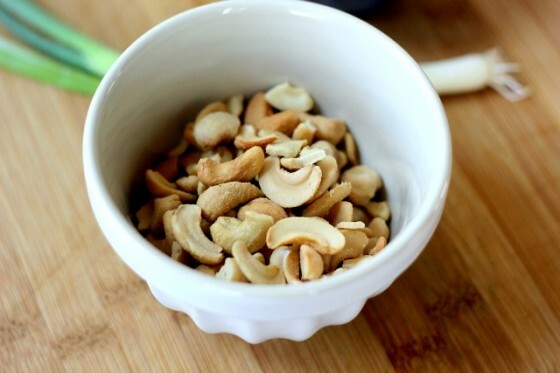 Mmmm, those cashews, and that sauce…yum! What a great tip…I never would have thought that baking soda was the secret ingredient! I’m a huge fan of Asian flavors, too, so this is a must try! Have a great weekend, Cassie! I love stir-fries! This one looks fantastic 🙂 Cashews are one of those things that I always had on hand for a while and definitely over did it on. I think I could be ready for them again in this dish though! Wow this looks like take out straight from a Chinese restaurant! Looks great Cassie! This looks so fresh and delicious! Baking soda…I’m intrigued. I’ve had my eye on Rasa Malaysia’s cashew chicken recipe for a while and you’ve definitely convinced me I need to make it soon! Yours looks delicious. I love cashew chicken! This looks so delicious! Never heard of adding baking soda to chicken! I want to try this now! I have never heard of letting the chicken sit in baking soda before marinating it. I will have to try that! Thanks! Baking Soda?! I gotta try :). I too LOVE Asian flavors! Wow!! This looks SO good! I LOVE cashew chicken!! Do you have a cheesecake factory next to you? They have the most AMAZING cashew chicken dish EVER! I can’t wait to try yours! Mmmmm! Oh yeah Bee’s recipes are amazing. I was lucky to receive her first cookbook for a review and I cooked several dishes from the book. Her recipes are so perfectly written. I wish mine is as accurate as hers to the readers. 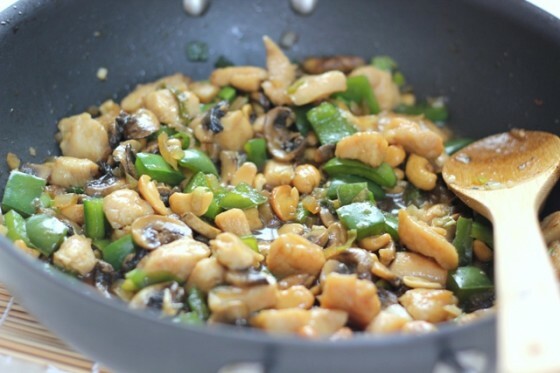 I’ve never cooked cashew chicken, but I am sure this one is a keeper! You take really delicious photography Cassie! yummm Cassie, this looks absolutely amazing! I’m so curious now – why the baking soda? You know, I haven’t done the research as to why it works, I just know it does. 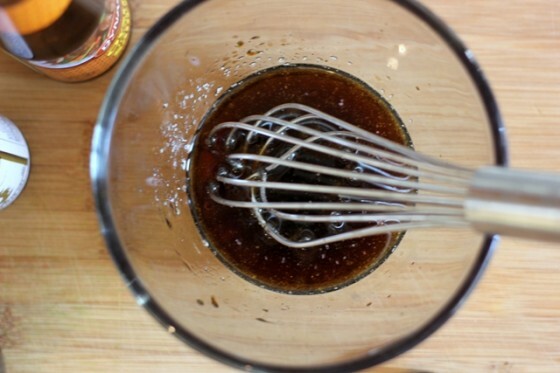 I make this very often and use the method for other dishes and it works amazingly every time!